The finest quality angling flies tied on very sharp hooks. Greetings gentle fly anglers! 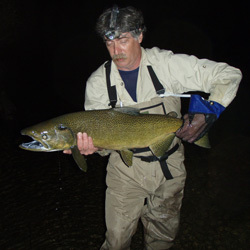 This site is an online store for the finest quality angling flies. My company, Palacios Design Studio LLC, is based in Ann Arbor, Michigan, which is where I tie all of the flies listed in the Fly Catalog. No cheap foreign flies here! As I am a fly-fishing nerd rather than a computer nerd, my site is designed with simplicity and functionality in mind. I am attempting to recreate your favorite streamside fly shop on the Internet. You will find no pop-ups, advertising, or hidden links that magically transport you to the far corners of the virtual universe. I have placed site navigation tools at the top and bottom of every page so moving through the site should be as easy and painless as possible. Like the stonefly nymph to the right, this site is under construction. New catalog pages will be added as I get them done. There are lots of bugs to work out, every pun intended. Some images are missing and not all links are functional, these problems will be fixed as I complete the design and construction of this website. If you intend to order flies please read the Order Info page. 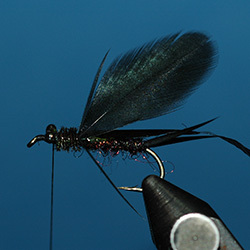 Take a peek at the About page for some ideas regarding fly design and construction, streamer fishing, and more fun stuff to follow. Please feel free to contact me as your comments are always welcome. Thanks for your understanding and patience. I'm looking forward to hearing from you.